To find evidence of the near-total disconnect between US corporate health and overall stock market valuations, close your eyes and throw a dart. It’s everywhere. The markets have risen in direct synchrony with Fed ZIRP policy, heedless of the fundamental metrics of the companies making up those markets. It’s staggering to think that the ‘ratings negative’ trend has already picked up such steam. The fed rate isn’t even at 2% yet! We’re headed for a tidal wave of bankruptcies should interest rates approach anything resembling historical averages. The global economy is picking up steam. The U.S. economy is roaring to strength. 2018 is going to be another 'peak year'. Tax cuts are driving equity valuations up. Corporate balance sheets are getting healthier by the day... and so on. The positivity of recent headline has been contrasted by the realities of the gargantuan bubble in corporate debt. A bubble that is not going to get any healthier any time soon. 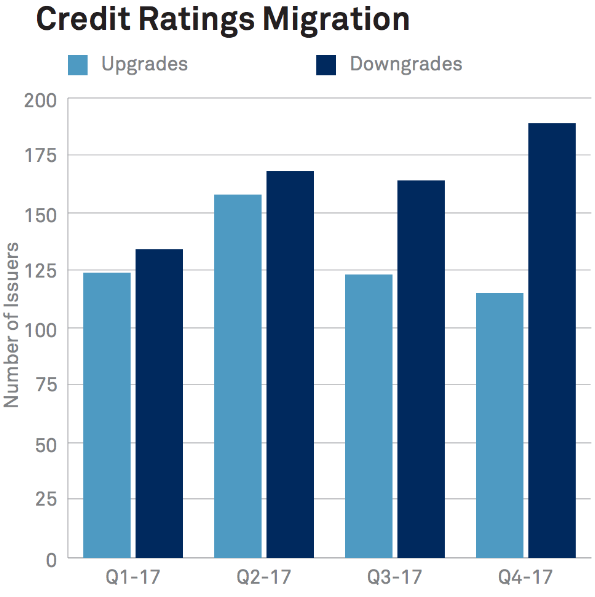 In fact, based on the latest data (through 4Q 2017) from S&P Global Market Intelligence, H1 2017 trend toward relatively balanced (or rather relatively moderately negative skew) credit ratings has turned decisively negative in 2H 2017. Worse, 4Q 2017 dynamics were markedly worse than 3Q 2017 dynamics.